“I think I’ve always been a little bit cross about fourth wall theatre, if I’m really honest,” Lucy Ellinson suddenly admits in the middle of our conversation in the Albany cafe. She’s smiling as she speaks, any crossness buried beneath a warm grin, but a quick glance at her work is enough to confirm this aversion to distanced realism. Her last project was Unlimited Theatre’s Money the Gameshow, a show dissecting the current financial crisis through the interactive format of the TV gameshow, while she’s now appearing in a piece of lightly immersive solo storytelling. Even in the Gate’s thrillingly visceral production of The Trojan Women, in which Ellinson appeared at the end of last year, she had an itching temptation to “sneak under” that invisible barrier, to sit amongst the audience and “do a little agitating”. The show, described as “a surround-sound adventure which happens mostly in your head”, uses Ellinson’s persuasive storytelling and a vivid soundscape by Lewis Gibson to create an action-fuelled thriller that sprints through the landscape of the imagination, narrating a story of resistance against a dulled corporate world. Despite the relative lack of visual stimulus, its rapid shifting from frame to frame acquires the quality of a graphic novel, just one that’s sketched in the minds of the audience. The graphic novel is also an apt reference point for its invitation to the reader’s imagination, offering just enough to work with. As Ellinson explains, “you look at it, you imagine yourself right into it, but you’re still aware of yourself as a reader, as an outsider – you’re able to do those two things simultaneously, which I really like”. In this sense it’s similar to the radio play, which is “around and inside your mind at the same time”. 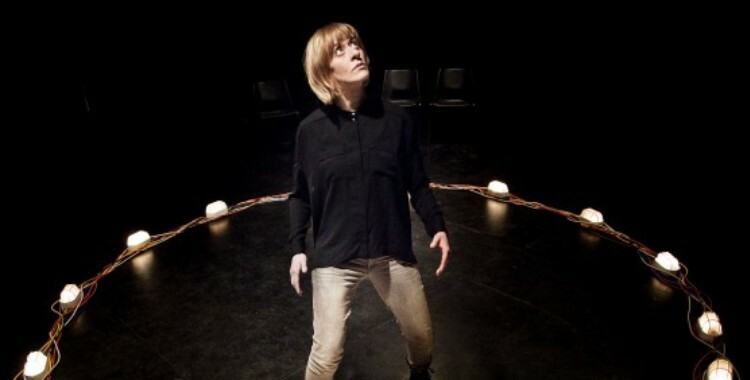 Beyond simply sparking the imagination, Ellinson notes how the show speaks to the current political situation, describing it as “very prescient, very relevant”. This was a piece that felt the impact of both Occupy and the riots, and without reaching for any explicit link, these influences show. For this reason, a level of audience autonomy – “allowing them to take that bit of work on their own shoulders and do something with it” – is essential. Ellinson adds, “it’s much more of an offering, which feels politically more in tune with the themes of the piece”. There is a blurry line, too, between the more traditional, text-driven process of The Trojan Women and the collaborative, devised work that is Ellinson’s preferred realm. She reflects that director Christopher Haydon “would have cast me because he knows I’m a deviser and like chirruping up with what I think here, there and everywhere”, before suggesting that collaborative ways of working are becoming more common, regardless of the pre-existence of a text. As Ellinson also explains, the artists involved in that process need not all be theatre artists; they could be videographers, jewellery makers, musicians. Making that point, one of Ellinson’s most striking projects over recent months – and the winner of the Arches Brick Award in Edinburgh last year – is Torycore, a furious marriage of austerity politics and death metal music, performed by Ellinson alongside Chris Thorpe and Steve Lawson. Borrowing lyrics from government speeches, the piece is being continually reworked to reflect the latest cuts, with a new outing later this year drawing from the 2013 Budget and the most recent slashes to welfare. As Ellinson bitterly observes, “there’s no end of amazingly, startlingly brutal language coming out of the present government, so there’s lots of text”. In the midst of all this calculated rhetoric, Ellinson recognises that it can be challenging to express one’s own political opinion. This difficulty to speak out is part of the impetus behind another of her ongoing projects, One Minute Manifesto, which will be returning to Battersea Arts Centre in May. Offering participants their very own soapbox and a platform to address as many or as few people as they like, the simple premise is to speak on a chosen subject for 60 seconds. The aim is that it facilitates the airing of those passionate opinions that might otherwise remain unspoken, something Ellinson has grown increasingly galvanised by: “the more I do it, the more I feel it’s really quite an important exercise to do”. Ultimately, this seems to be the driving force behind much of Ellinson’s work – getting people talking. As Ellinson drains the last of her tea and I gather my things, we continue chatting; about some recent work Ellinson was involved with at the Women of the World Festival, about getting primary school girls energised by the idea of feminism, about Ellinson’s connection with Forest Fringe and their current residency at the Gate. Even as we’re both glancing at our watches, conscious of the need to continue with our days, the pull of that conversation is hard to resist.